The 39-acre parcel on which Shaker Ridge Vineyard sits was purchased in late 2000 following an exhaustive multi-year search for a suitable Sierra Foothills location by proprietors Andrew and Elizabeth Standeven, both huge fans of the hearty red wines of El Dorado and Amador counties. 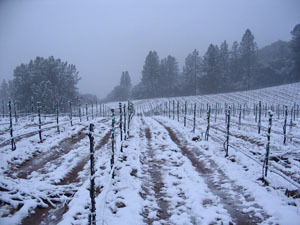 The site was uniquely situated in the southwestern corner of the El Dorado American Viticultural Area (AVA), distant from the Apple Hill and Fair Play sections of the El Dorado AVA, and only a few miles as the crow flies from the Shenandoah Valley of CA AVA. The site featured approximately 10 acres of rolling but plantable terrain, relatively clear of trees, with the only recent use appearing to be gold prospecting on prominent quartz outcroppings typical of the Mother Lode. In late 2001, we began clearing and ripping the site, and in May, 2002 the vast majority of the vineyard — consisting of equal parts of head-trained barbera and primitivo — was planted. Barbera and primitivo are Italian varietals with a proven track record in the Sierra Foothills for producing excellent varietal wines. In 2003, we extended the primitivo vineyard by a half acre, and also added a quarter acre of experimental plantings. In 2005, we broke ground on a three-quarter acre port vineyard featuring 5 traditional Portuguese varietals in proportions suitable for a field blend of port wine, all on vertical trellising. Our first commercial scale harvest of the barbera and primitivo was completed in the Fall of 2006. Shaker Ridge Vineyard is located on a gently rolling ridgetop parcel just off Sand Ridge road, closest to its west (Hwy 49) side. It is surrounded by valleys created by the North Fork of the Cosumnes River a couple miles to its north and west, and by the Middle Fork of the Cosumnes River to its southeast. The elevation is approximately 1500’ above sea level with hot days and cool nights typical of the Sierra Foothills region (and the occasional winter snow storm). The fog over the Cosumnes River valley as viewed from Shaker Ridge Vineyard.